We love hash browns here at Amoretti so we whipped up this sweet potato version and a flavorful vinaigrette to go with it! In a glass or ceramic bowl, combine the scallion, Aged Pomegranate Balsamic Vinaigrette, and mustard. Whisk vigorously. Add Blue Agave Nectar and continue to whisk until blended. Taste the vinaigrette and add salt and pepper as desired. Cover the vinaigrette and set it aside to allow the various flavors to merge, mingle and mesh while you prepare the hash browns. Put the sweet potatoes in a large pot and cover with cold water by 2 inches. Bring to a boil, add salt, and cook until tender. Drain well and let sweet potatoes cool slightly while you prepare the onion and mushrooms. Heat 1 tbsp butter and 2 tbsp light olive oil in a large cast-iron skillet over medium high until it begins to shimmer. Add the onion and mushrooms and sauté until the onion has softened and the mushrooms are golden brown. Add the garlic and sauté for another 30-45 seconds. Transfer to a bowl. Heat the remaining 1 tbsp butter and 2 tbsp light olive oil in the same skillet over medium-high until it begins to shimmer. Add enough sweet potatoes to the skillet to form one layer, season with additional salt and pepper. Stir in the onion and mushroom mixture and the kalamata olives, and allow them to cook, pressing with a spatula, until crisp and golden brown on the bottom, about 5 minutes. 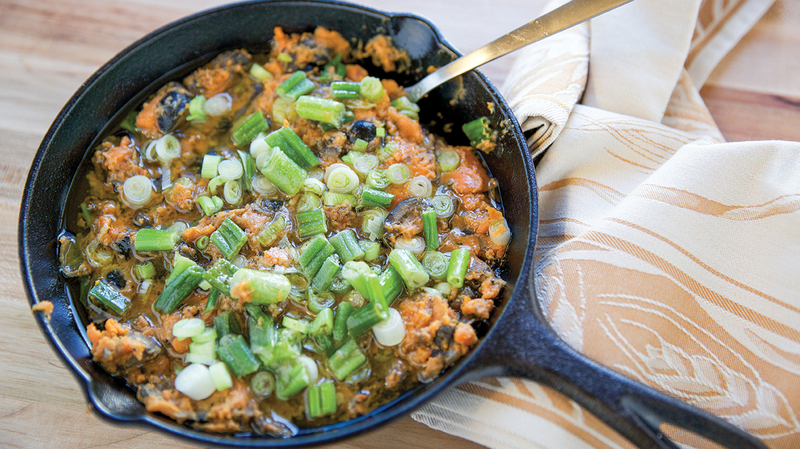 Place the sweet potato hash browns in a serving bowl, dress with the Scallion and Dijon Vinaigrette. Garnish with sliced scallion, parsley, and thyme.